I As you might already know, I love anchor charts! 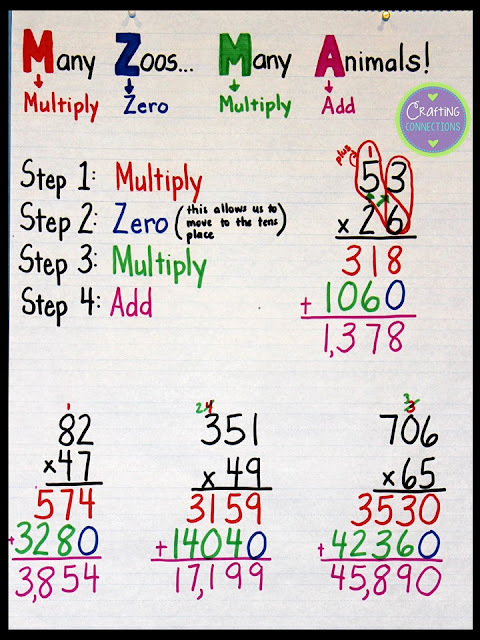 Therefore, when one of my third grade groups was ready to be introduced to multi-digit multiplication, I couldn't resist creating an multi-digit multiplication anchor chart! I came up with the acronym "Many Zoos... 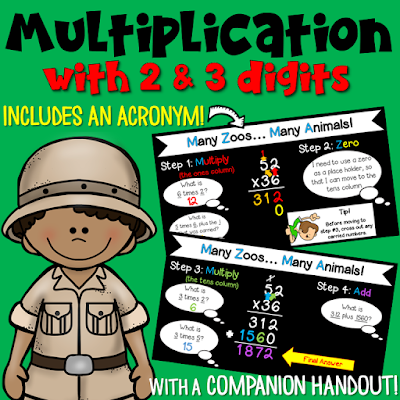 Many Animals" to assist students in remembering the steps in a two- or three-digit multiplication problem: multiply, zero, multiply, add. As you can see, I also color-code the steps. I worked through the problems on this anchor chart with students, so most of this anchor chart was blank white paper prior to the beginning of our math group. My students enjoyed working through the problems right along with me in their own notebooks, and color-coding the steps. We did the first step in red, the second step in blue, the third step in green, and the fourth step in purple. I created the following resources to aid in teaching this skill, as well. Feel free to click on the image to take a closer look at it! 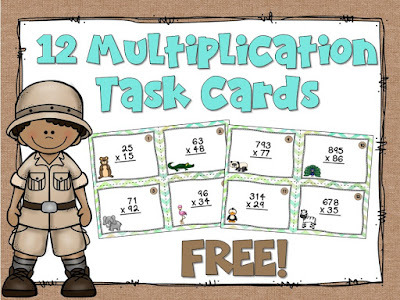 In keeping with the zoo theme, I created this FREE set of twelve task cards, also! I LOVE all your anchor charts, and I appreciate that you've shared so many great anchor charts with you. I wish I had this anchor chart a few months ago when I had my students start 2 digit multiplication. I will certainly be using these next year.